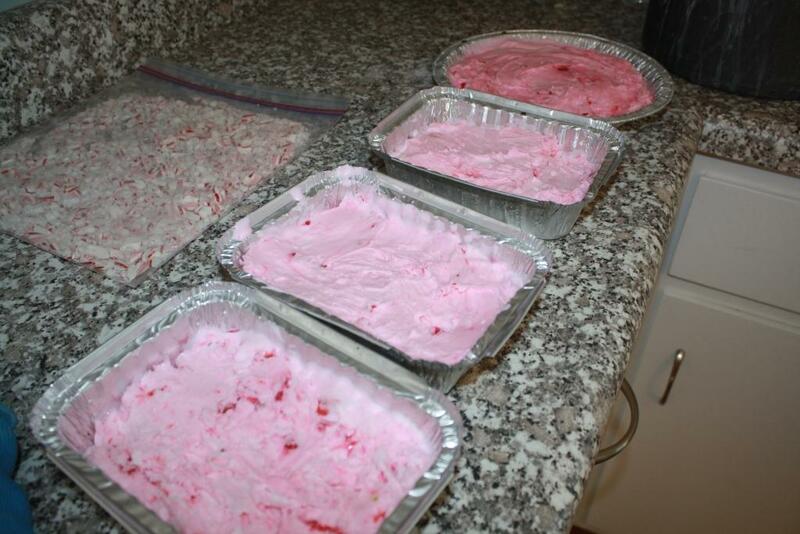 I like to make a big batch of Peppermint Stick Ice Cream Dessert every Christmas. My Grandma Jackie has been making this recipe every single year since I was born (and probably years before that). 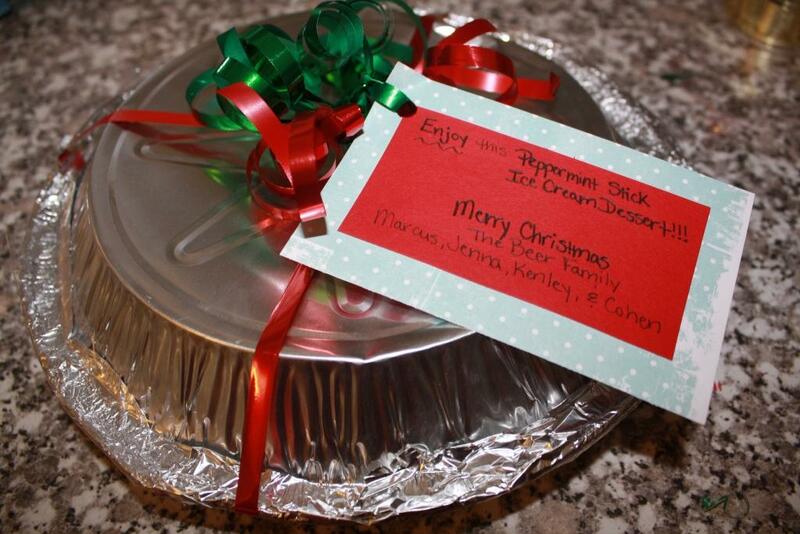 I always enjoy giving this away as a Christmas gift to friends or neighbors because it is very inexpensive and such a great Christmas-time Treat. I usually pass this out to our neighbors with our Christmas card. 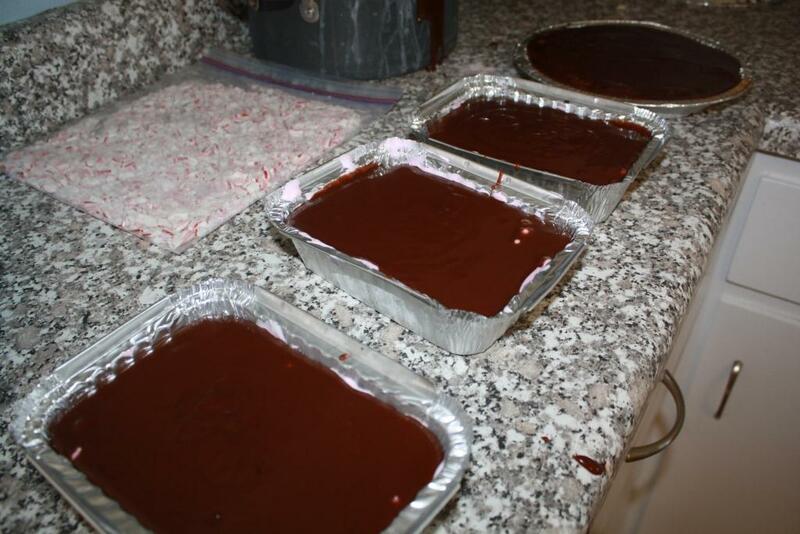 This recipe will fill FIVE 7×5 inch foil pans. 1 package Oreo Cookies (DO NOT get Double Stuffed). Note: Yes, it is my belief that there is a taste difference if it isn’t pink 🙂 So get the pink stuff! Kemp’s or Edy’s are good brands that I have used. 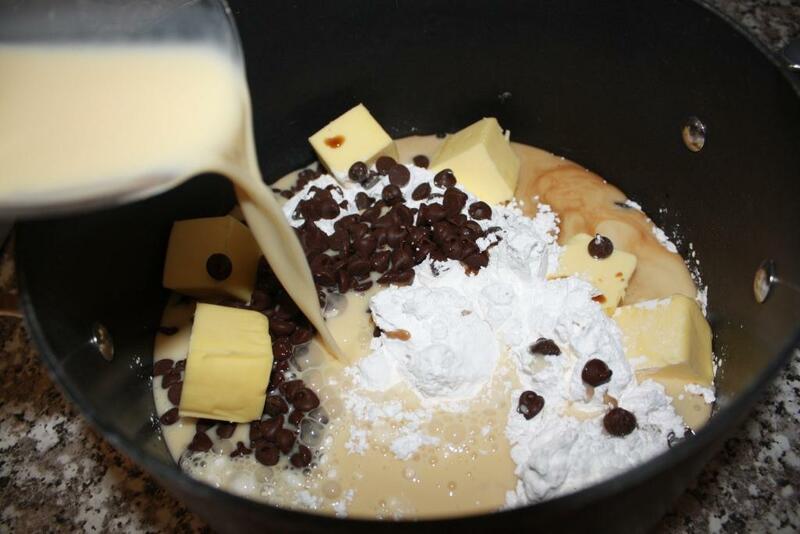 Place the Oreos in the freezer over night so they are cold and will crush better. 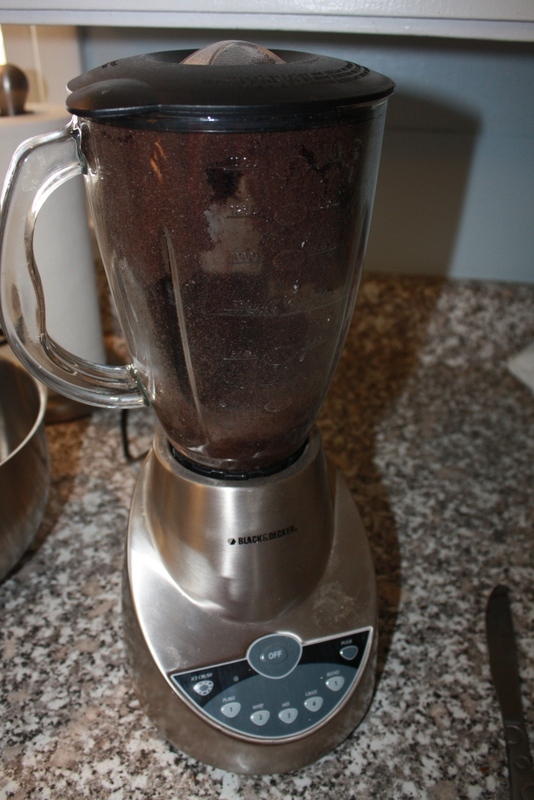 Place 6 Oreos in a blender at a time to crush. 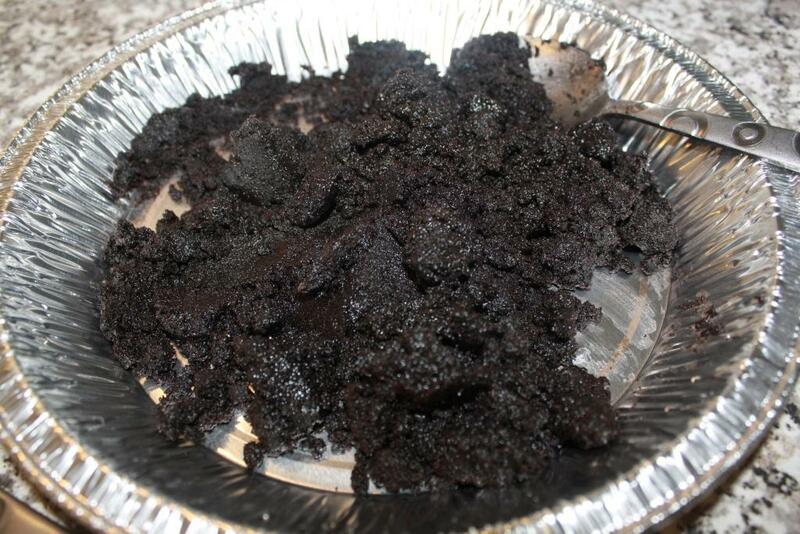 Once crushed place in a large bowl while finishing the rest of the Oreos. 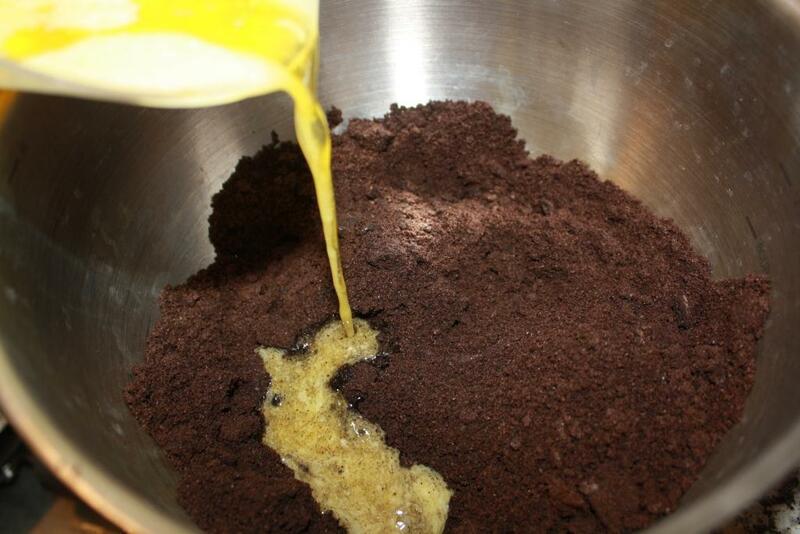 Melt butter and stir with all crushed Oreos. 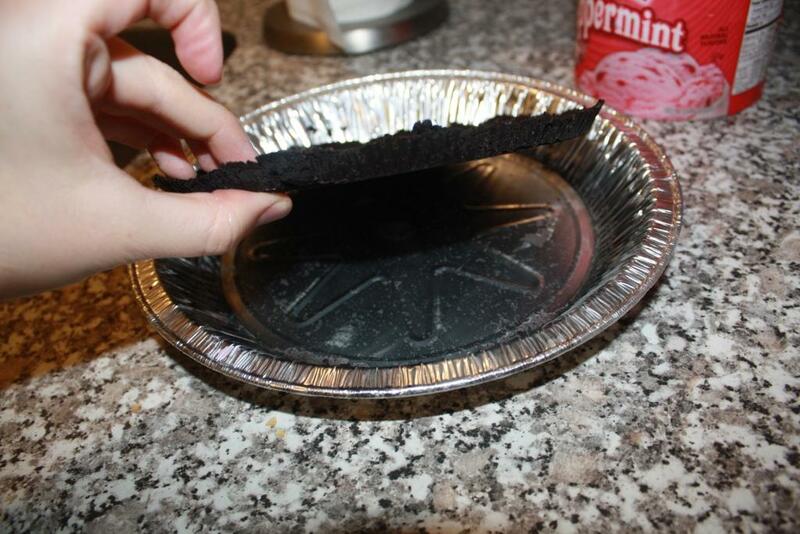 Place the cookie crust in the foil pans (if they are a gift) or a 9×13 pan (if it is for *you*) and use the back of a spoon to smooth out on the bottom of pan. Place in the freezer for about an hour. After you take it out it will be frozen enough you can lift it up, without it crumbling. 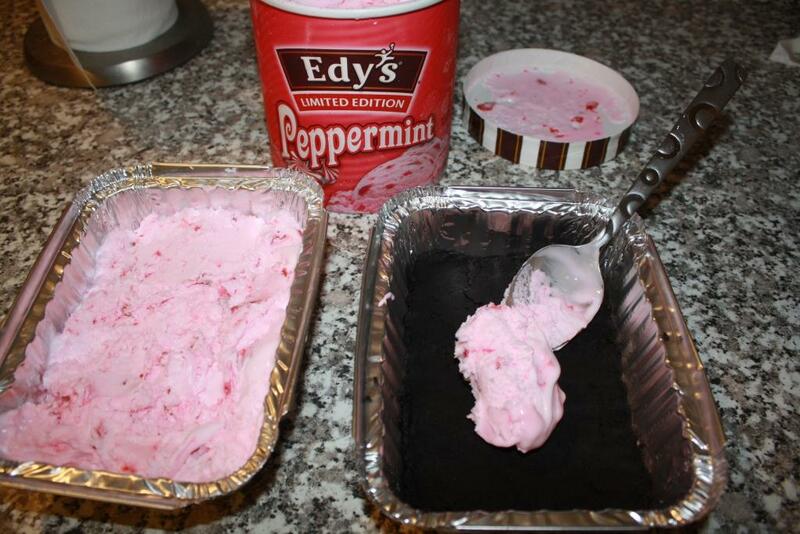 Once the crust is frozen take the peppermint ice cream out of the freezer for a few minutes to thaw. 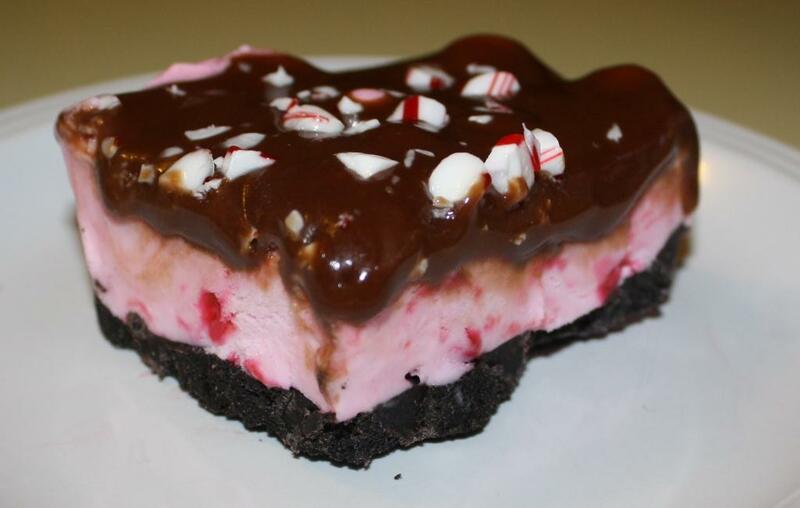 Scoop ice cream onto top of crust and smooth out with the back of a spoon or spatula. The more melted the ice cream, the easier it is to spread. Place back in freezer for about 30 minutes, or until ice cream freezes again. Mix all ingredients over medium heat. 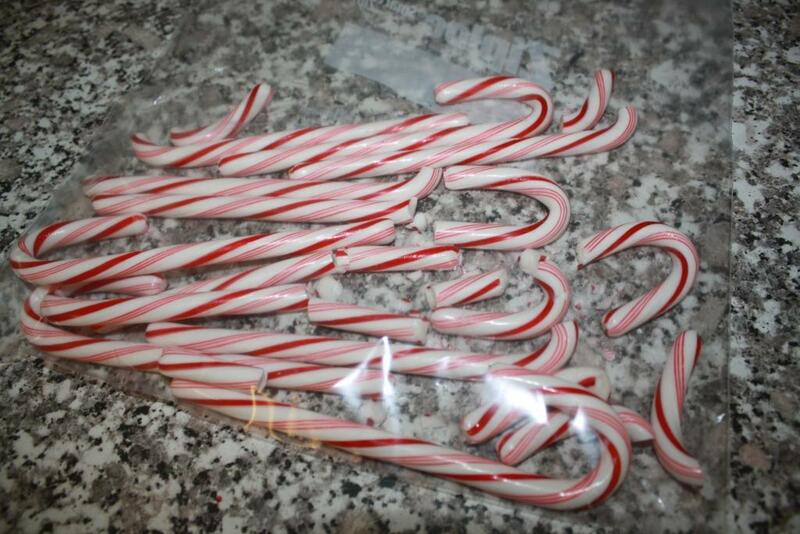 While you are waiting for it to start boiling, unwrap the candy canes, place in a zip-loc back and crush. 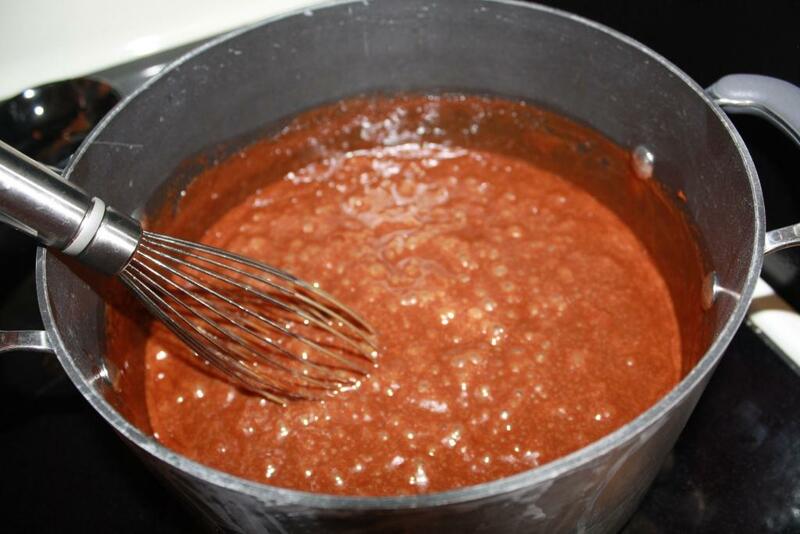 Once mixture is boiling stir continuously (still on medium heat) for 10 minutes. 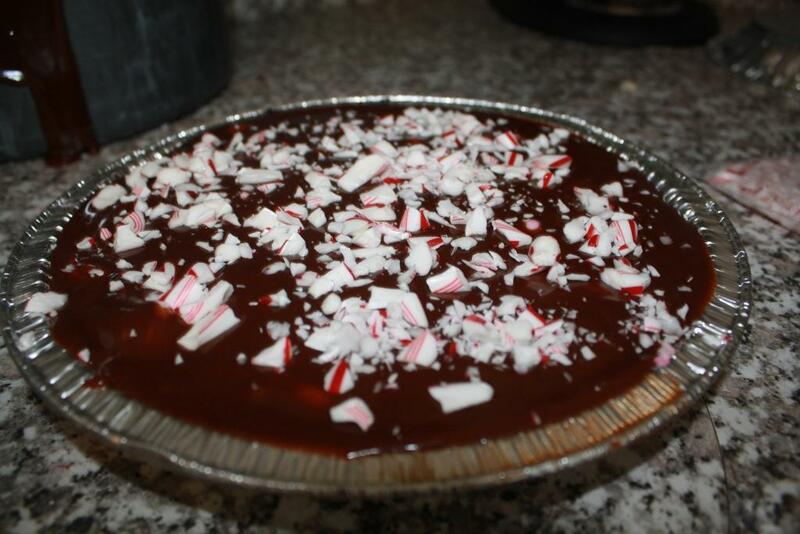 Sprinkle candy canes on top. 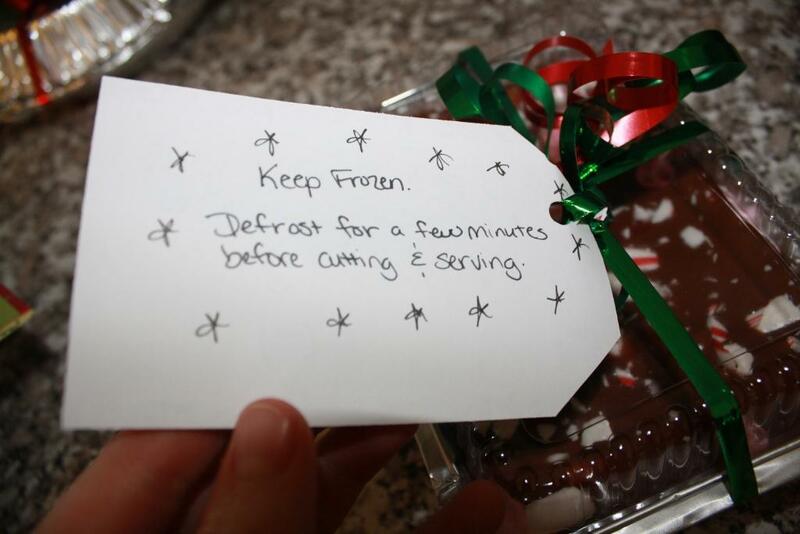 Place back in the freezer for an hour or so before you hand them out as gifts. 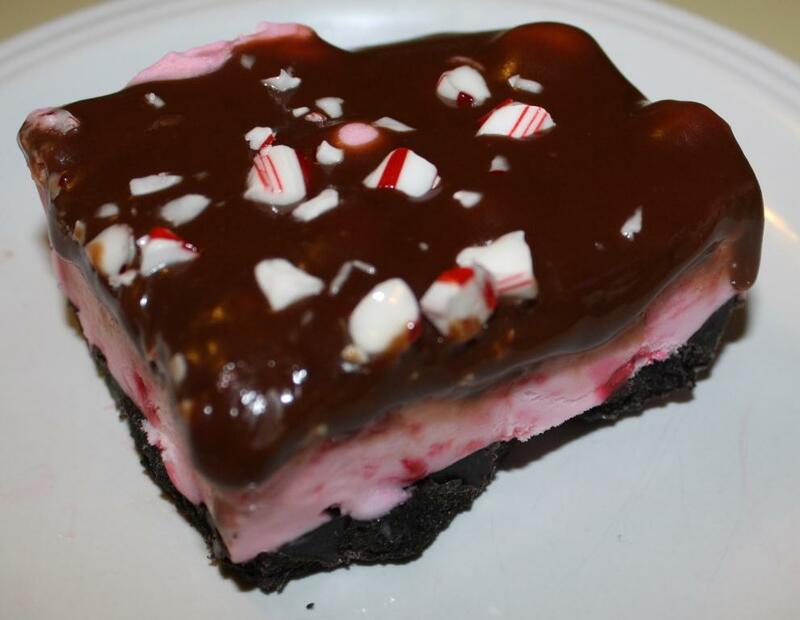 The fudgy topping needs harden. 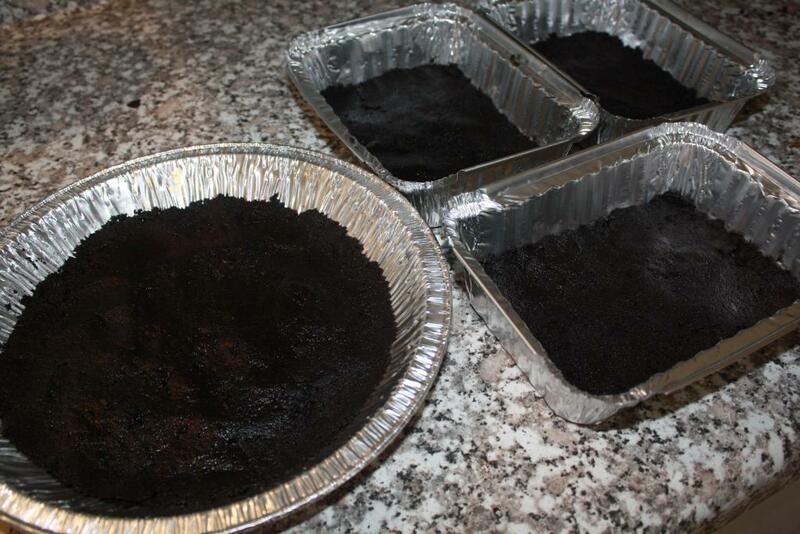 When you are ready to serve you want to let the dessert stand for a few minutes at room temperature so that it is easier to cut into the Oreo cookie crust. I wrote those directions on the back of the card. Oh yum! 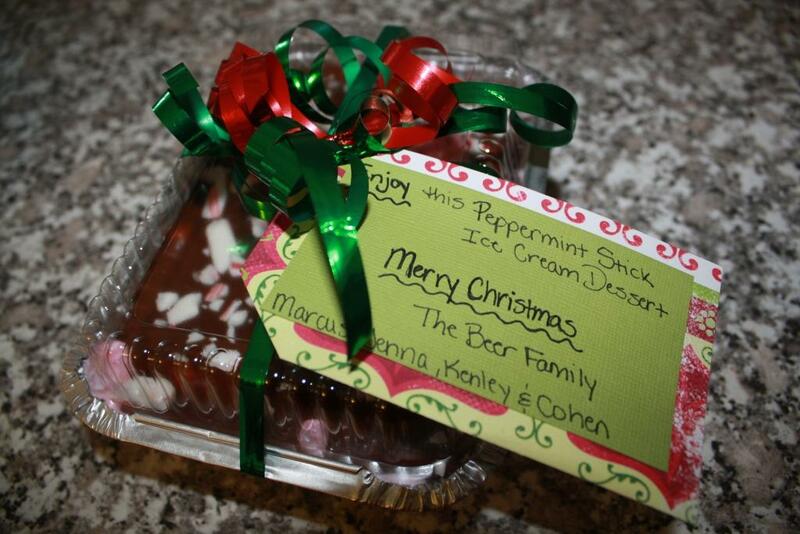 This is such a GREAT Christmas TREAT! 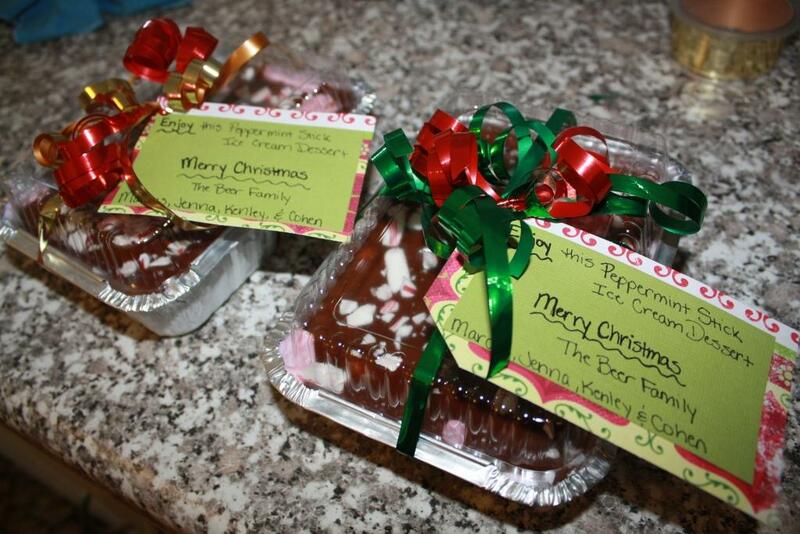 This entry was posted in About Food, About Fun Stuff, Crafts, Dessert and tagged chocolate, Christmas, Christmas dessert, Christmas gift, Christmas Recipes, dessert, gift, ice cream. Bookmark the permalink.